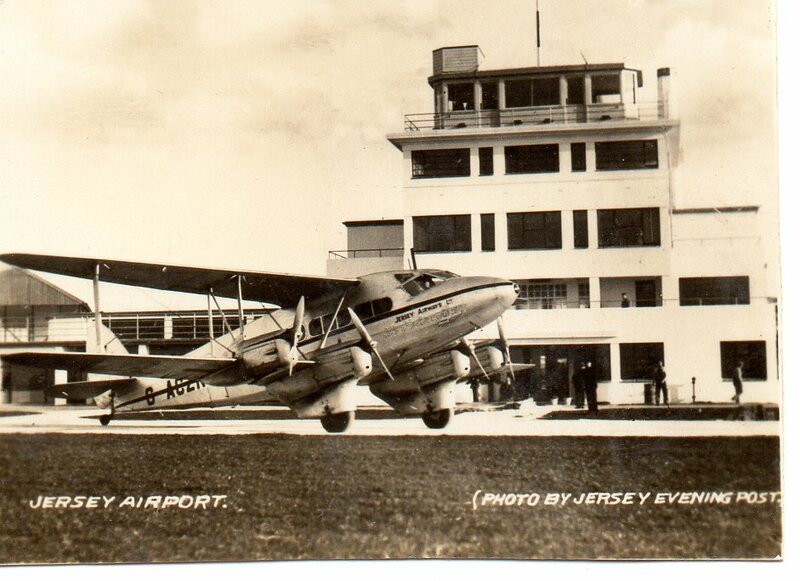 Jersey Airport has since been renovated, added to and expanded. Maybe you can date this postcard? 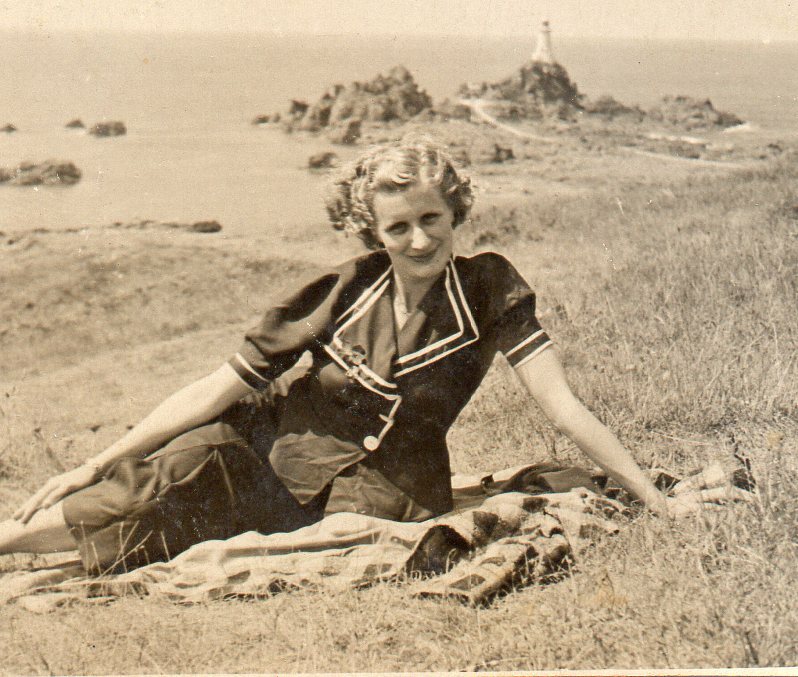 Who is this young lady sitting infront of Corbiere Lighthouse? Corbiere Lighthouse is still a popular photo spot for both locals and tourists. Is this your ancestor who was either living in Jersey or on holiday at the time? Unidentified houses and location - do you recognise these buildings? The photo of the three buildings on the edge of the beach are unidentified. I am not too sure this is in Jersey. 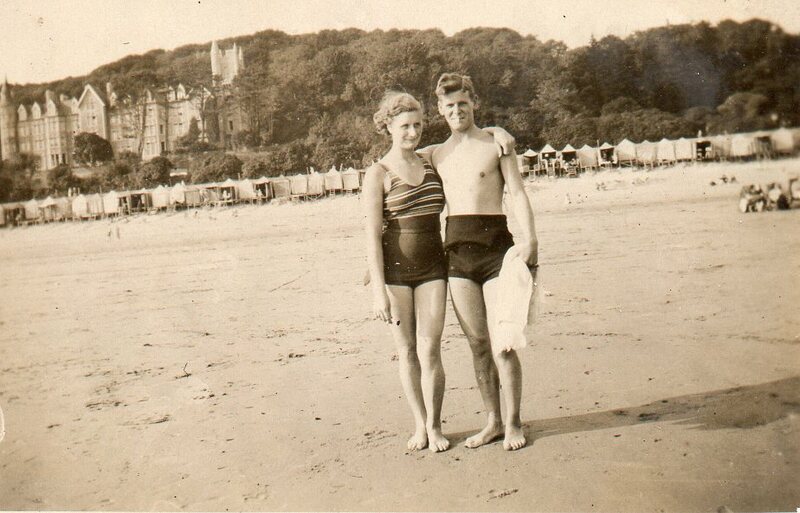 Where is this magnificent building behind the row of beach huts? 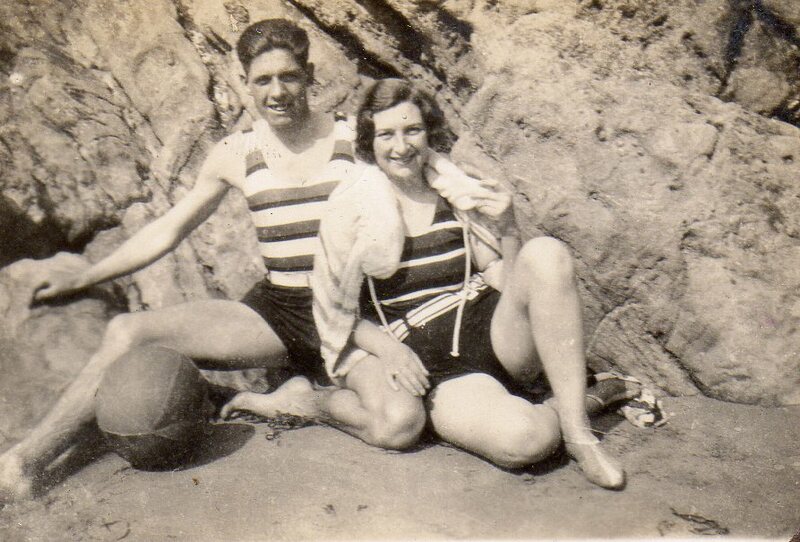 Notice the lady is wearing a strange type of beach shoe. Do you recognise anyone in this group? I cannot identify the building in the background. 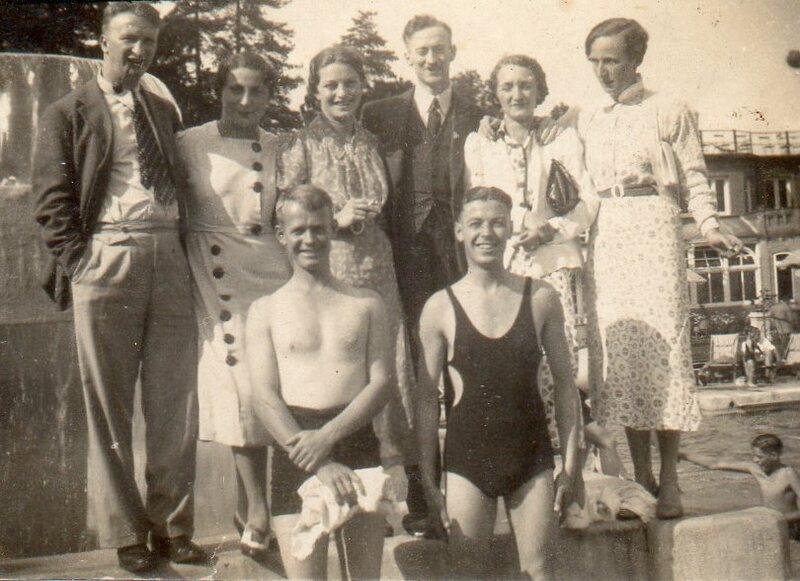 Notice that the young boy behind the group is getting out of a pool. Where is this? Is this a wedding photo? 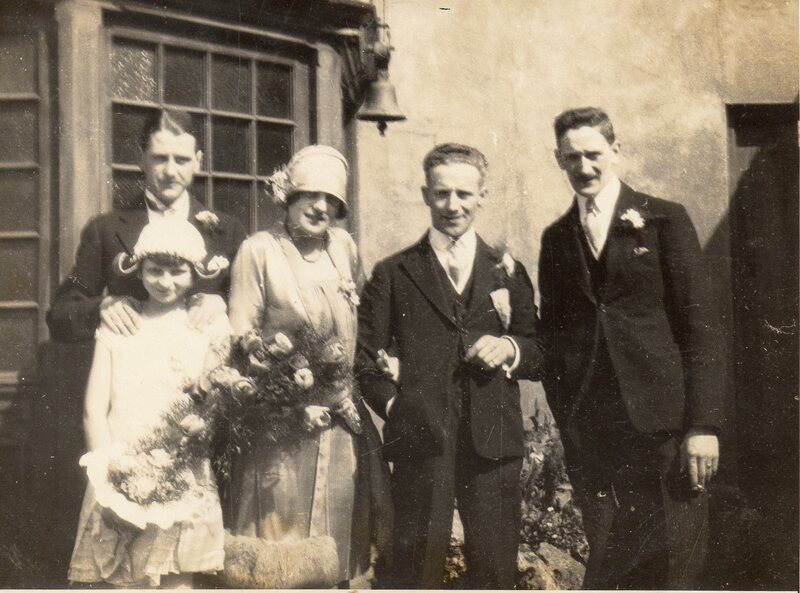 I wonder if these photos are of a family travelling to Jersey for a wedding or something similar? Many thanks to Richard who sent these photos to me and many more. There will be more posts including his photos to follow. If you recognise a place or person in any of these photos, please write in and let me know, it would be good to hear from you. The 3rd photo with the 3 buildings on the beach is definitely St Brelades Bay in Jersey. The hotel still exists though is harder to recognise as all 3 buildings are now much linked and extended, upwards and outwards. It was until recently the St Brelade’s Bay Hotel, although it recently changed hands and has undergone refurbishment, and perhaps has a new name/function. It no longer leads directly to the beach as the occupying German forces in WW2 built a defensive sea wall out of concrete in front. I can’t help with the other photos. Sorry! Thank you for stopping by and taking the time to contribute to this blog. 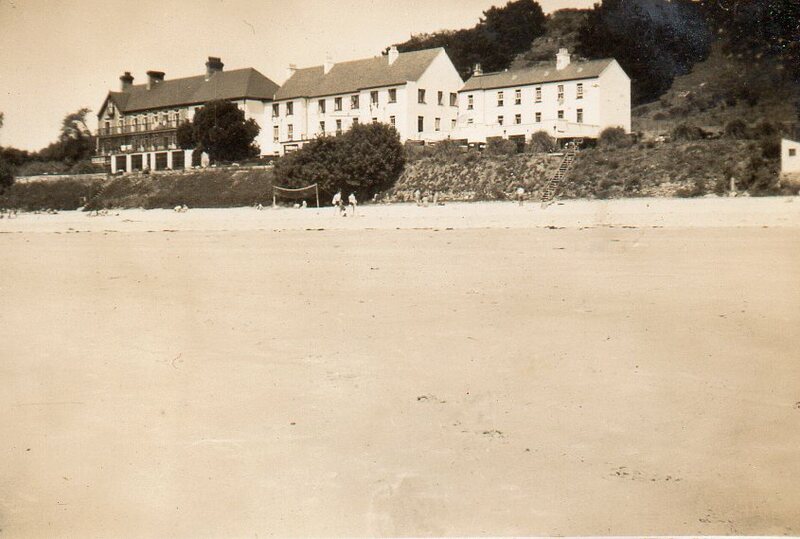 I shall find a modern day photo of St. Brelades Hotel to compare the old one to. The ornate building in background is Chateau des Roches, built 1882 by an Italian architect for Jules Vannier ‘a Parisian curio merchant’,[Sinel: Jersey Through the Centuries – a Chronology] and source of the painted cast-iron statue of ‘Centaur with Cupid’ on plinth now outside Jersey Museum – said to be a copy of a bronze in Paris… In 1889, house rented out to French political figure General Boulanger, who came to Jersey in exile following a military coup… [Sinel again] – and later fled to (Belgium?) where he shot himself on the grave of his lover (!) The building was still there in early 1960s when I worked at Hotel L’Horizon… Now apartments, but some of the strange / fancy buildings remain in garden, altho’ redevelopment of the site gives a nod to the style of the former building. Hi Sue, Thank you for this fascinating information about the building. Just to confirm, are you talking about the building in photo 3?